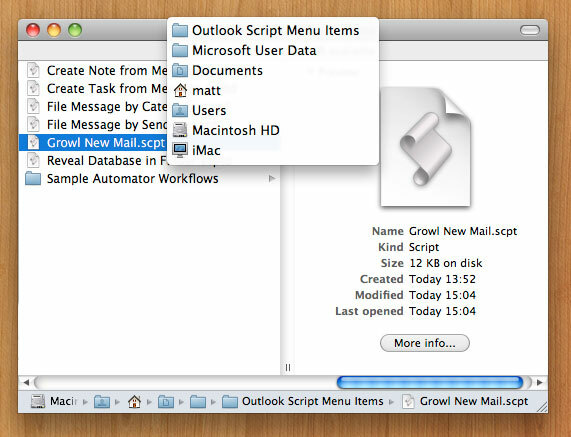 I recently started using Microsoft Outlook 2011 Mac as my email client (on a trial basis), and wanted to have Growl notifications whenever I received a new message; it’s pretty simple via AppleScript. Here’s how. First, make sure you have Outlook and Growl installed. Then download this AppleScript. It’s editable, so you can have a look at it. It’s based on an Entourage script. You can save the script wherever you like; I put it in the Outlook Script Menu Items folder, for convenience. That folder is located inside the Microsoft User Data folder within your Documents folder, as shown below. 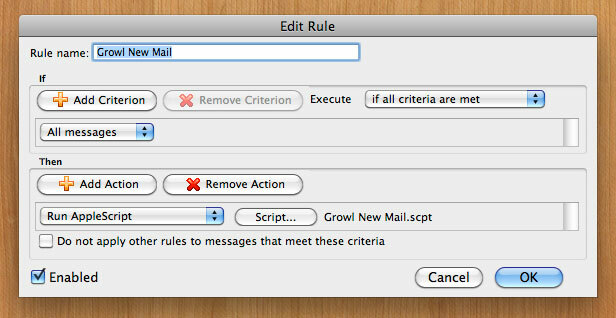 Next, create a Rule in Outlook. Configure it as shown below (i.e. use criterion “All Messages” and action “Run AppleScript”), and choose the script file you downloaded. Make sure the rule is enabled. That’s all there is to it. Now, whenever you get a new email, you’ll see a Growl notification using your default Growl style. To change the wording of the notification’s title and contents, you can edit the AppleScript file. Footnote: for the love of whatever deity you believe in, don’t ask me for AppleScript help. I hate the language, and use it only under duress. If you enjoyed this post, feel free to follow me (@mattgemmell) on Twitter!